Having secured a new job as a fisheries biologist at a marine station in the Upper Chesapeake Bay, Alexandra Allaway finally comes home to her grandfather and his best friend – the two men who’ve raised her since she was a baby. Instead of a happy reunion, the friend has vanished and her grandfather has been murdered. Clutched in Randy Allaway’s hand is an old gold coin. She also finds an old map with three dots and a message to tell no one and that someone named JAllaway might come. Unable to stay in the house, Alex bunks in her grandfather’s tugboat, Vital Spark. Her companion is a misbehaving, over-exuberant nuisance, a dog whom she calls “Water Boy.” Long after Alex falls asleep, a noise awakens her. Emerging from the cabin, she sees a slender woman dressed in white whispering to Water Boy. When the intruder spots Alex, she dives overboard and vanishes. Once the police arrive, Alex heeds the warning to keep silent. Detective Jay Braden leads the investigation, but personal problems at home soon require more of his attention and his partner, Detective Will Jenkins, must spend more time with Alex. She’s uncertain how she feels about this, since her acquaintanceship with Will dates back to their high school days. On one hand – the one that dropped the eraser down the back of her jeans – he’s a jerk; on the other, he’s attractive and she remembers the one night they spent together a long time ago. 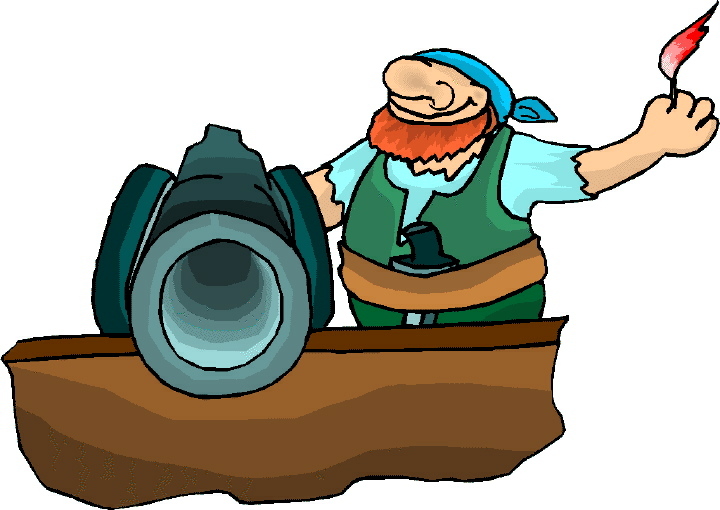 Each year around this time, her hometown of River Glen stages its annual pirate festival. According to legend, the infamous pirate Giles Blood-hand sailed up the Chesapeake and buried his treasure here. As far as Alex knows, no one has ever found the legendary gold, but that doesn’t mean people aren’t still looking for it. Against her better judgment, but at a friend’s urging, Alex dons pirate regalia and attends the festival. While there, she meets Carly, Will’s five-year-old daughter. Carly is the only good thing to come out of his relationship with his manipulative ex-wife. Carly loves playing “pirate” and innocently remarks that Alex looks just like Giles Blood-hand’s sister. Alex works to puzzle out the clues left to her while the police investigate not only her grandfather’s death and friend’s disappearance, but also the murder of another woman bearing a marked resemblance to Alex. Disparate threads unravel to reveal an intricately interconnected web whose origins date back to Giles Blood-hand, and with ties to a twenty-six-year-old unsolved murder. The first entry in the Chesapeake Tugboat Murders series, Vital Sparks keeps you guessing until the very end. The book is populated with a host of characters similar to a circus sideshow, enriching the story and making your visit to River Glen memorable. 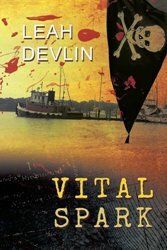 Devlin deftly weaves science, history, pirate lore, romance, and mystery into a remarkable tale with serpentine twists and a final showdown that promises more puzzling mysteries to come. Her Giles Blood-hand Wikipedia entry seems authentic, but it’s as much a figment of her imagination as this delightful cast of characters and thrilling romantic suspense. Book two in The Chesapeake Tugboat Murders returns readers to the quiet town of Glen River in the Upper Chesapeake Bay. This is a sleepy place filled with quirky residents except for once a year when they celebrate one of their founding fathers – Giles Blood-hand, a notorious pirate who settled here in the 1600s with many of his fellow pirates. They brought with them an enormous treasure comprised of emeralds, rubies, pearls, gold, and silver, initially stolen from Spaniards and later taken from another pirate, Bartholomew Dodd, whom they left for dead before sailing north. These buccaneers became fishermen, carpenters, and farmers and their treasure was cached in a secret place and used when needed. Descendants of the original pirates include Alex Allaway, a marine biologist with a phobia of spiders, and Will Wilkins, a detective with a young daughter. They oversee this stash of valuables, doling it out when necessary and protecting it from the many treasure hunters searching for it. Alex and Will also have an on-again off-again affair, because Alex’s unusual upbringing makes her reticent to take the plunge. Nina Vega, who was Alex’s college roommate, has moved to Glen River to teach at nearby Tolchester College. Not only does she wish to become a full professor of sociology, but she also needs to expand the parameters of her research on fishing communities. Soon her arrival, she and Alex go boating on the bay aboard Alex’s tugboat Vital Spark. Shortly after Alex points out an abandoned cottage on a cliff overlooking the Chesapeake, a woman steering a yacht causes a near accident. The ensuing waves crash ashore and topple the house from its precarious perch; once the waves subside, Nina and Alex discover that several bodies were buried under the house. Glen River’s chief detective, Jay Braden, arrives with his partner Will, the medical examiner, and a forensics team. The investigation turns up several interesting facts. Only one body shows signs of foul play. No one has seen the owner of the cottage in years, but the property taxes have been paid regularly. Among the detritus found on the surrounding land are rope, tape, and cylinders with holes in the top that might have been used to store creatures. The identities of the dead are unknown, but as Lisa Paco – the police force’s gum-chewing mystery buff who’s a wiz at researching on the computer – delves deeper into these mysteries, she begins to suspect that one of the deceased may be her father, who went missing many years ago. If correct, her mother may be the murderer and there is no way Lisa will ever let “the best mother in the world” be arrested. The nuisance yachter is Pamela Dodd, whom the residents see as a successful model who comes every summer with her current boy toys to hunt for treasure. (She oversees while the guys do all the work.) While her hunt for this pirate hoard is real, her reasons are known only to herself. She’s actually the multi-great granddaughter of Bartholomew Dodd, the rightful owner of the pirate treasure. Now that he’s long dead, it belongs to her. When Alex plays a trick on her to discourage her hunting, it brings Alex directly into Pamela’s crosshairs and no matter what she must do, Pamela intends to locate and seize the treasure for herself. Unlike the first title in the series, which was predominantly Alex’s story, Spider centers more on Nina and the college. On her first day of work, she ends up in the hospital after a roof slate slices off her finger, resulting in the loss of her engagement ring. Not only must she adapt to this injury, but she also must adjust to the realities of her new job – out-of-date technology, a crumbling office building badly in need of repairs, and a president and her staff (the Weird Sisters) who seem far more interested in meeting quotas and adhering to rules than they do with learning and research. And just when Nina needs him the most, her fiancé, who hasn’t yet arrived in Glen River, goes strangely silent. Spider is as much a tale of relationships and interactions as it is about miscommunication and misinterpretation. It also ably demonstrates the extreme lengths some people are willing to go to when trying to locate legendary gold or to protect those they love. 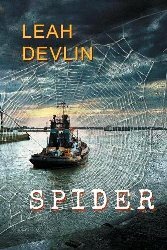 Devlin does a fantastic job spinning the disparate threads into an intricately woven mystery that’s a challenge to solve. The many twists and turns mirror a demented mind of keen intelligence. Only the lack of good proofreading, especially in the last third of the book, mars this whodunit where even the weapon is as offbeat as the unique characters populating Glen River.